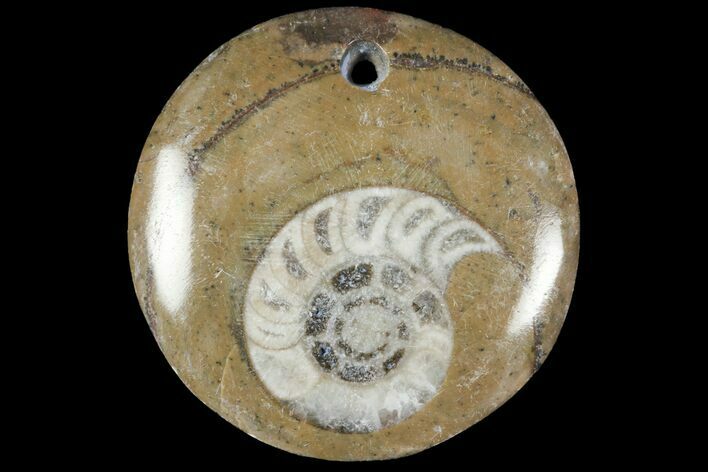 This is a single fossil Goniatite pendant. These Goniatites are Devonian in age and are quarried from the Atlas Mountains in Morocco. It has a small hole drilled so it can be turned into a necklace and yours will be from 3/4" to 1 1/4" wide. The photos are representative of what they look like though you will not receive the exact one pictured. Goniatites possessed a shell which is divided internally into chambers filled with gas for buoyancy. An open chamber at the front of the shell provided living space for the animal. The general morphology and habit of goniatites was probably similar to that of their later relatives the ammonites, being free swimming and possessing a head with two well developed eyes and arms.